I am not the biggest fan of beer (to be honest: I really hate to drink it), but I am a big fan of Bavarian food (or at least the vegetarian dishes). This is the reason I have to share my favourite one: Breznknödl. 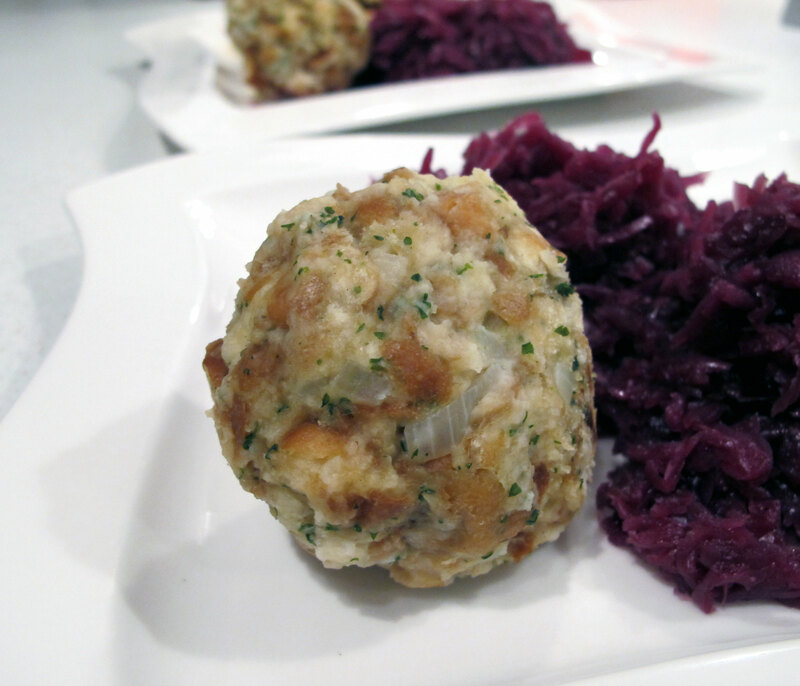 Many people (at least German people) know and love bread dumplings. But I guess when they try dumplings made of pretzels they don’t want to eat the ones with bread any more! 1. Cut or pick the pretzels to small pieces. It is easier if you do it when they are still fresh (then let the pieces dry for 1 day). If the pretzels are too hard to cut, put them into the microwave for 10s, this makes them soft again. 2. Heat the milk and pour it over the pretzel pieces. Let it rest for 10min. During this time, chop the onion and roast it gently in the butter. 3. After the onion has cooled down a bit, add them with the egg and parsley to the pretzel pieces. Knead the dough until smooth and taste it with salt to flavour. If the dough is too sticky, add as many breadcrumbs as you need. 4. Divide the dough into 5-6 even portions and form balls out of it. All of the cookbooks I have told me to put them into the water as they are. But I experienced a lot of accidents, where the dumplings just fell apart in the water. This is why I always put them into aluminium foil to avoid that. I promise that there are no disappointments any longer with this method! 5. Set up a large pot with salted water until it is boiling hot. Put the dumplings into it and let them brew at low heat for 15min. 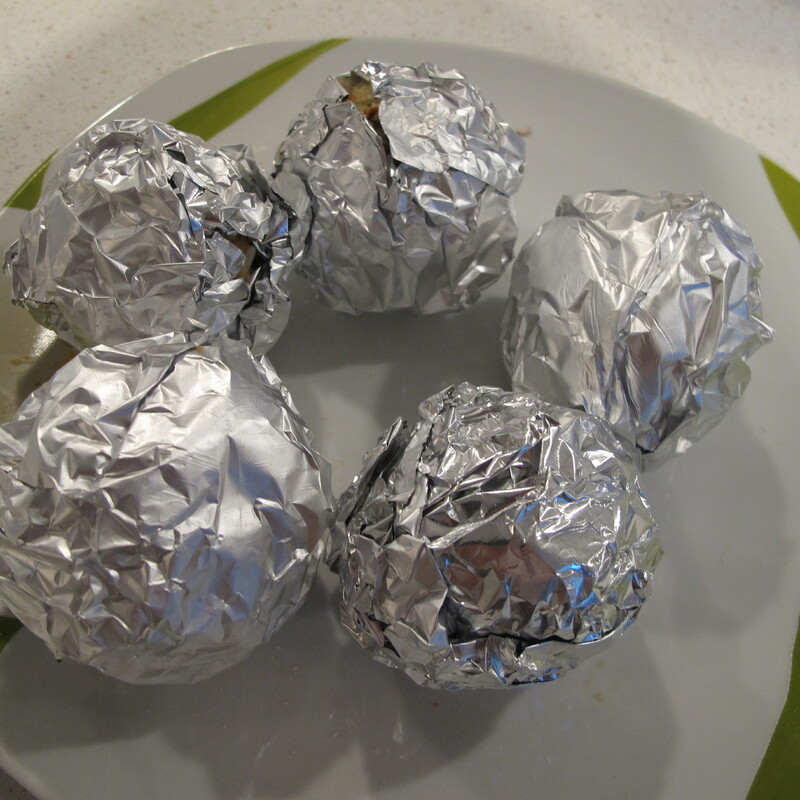 Remove the foil and serve them hot! Typically you eat them with mushrooms and cream sauce, but I think they also harmonize with red cabbage very well.